Let’s go in stacked order : Latest first! This is probably the best instance of all, I had this special privilege to meet Mr. RMS during the inaugural function of Techkriti. It was a day that would never be forgotten. 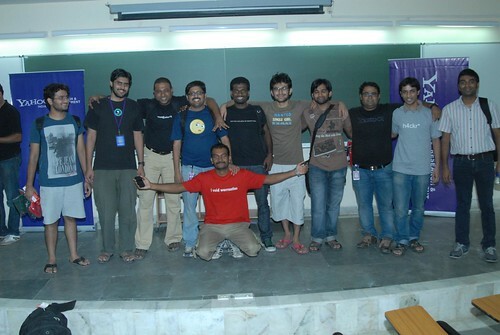 I was lucky to have this opportunity and it was nice interacting with him on topics like ‘Mukthi’ Software, ways of contributing to Free Software as a programmer and as an activist and supporter of FSF. The picture was taken by Agrim, have a look at his other awesome pics here. Job at Yahoo Research Labs! With Yahoos! at Hack U! A lot remains to be said about the interview process, but briefly, it was a great experience to have cleared a marathon of 8 interviews (5 telephonic + 3 onsite), luck played a critical role here too, it was all thanks to Hack U! in which our app, Smart Location Aware Chat client (slac.in) won 3rd place :). 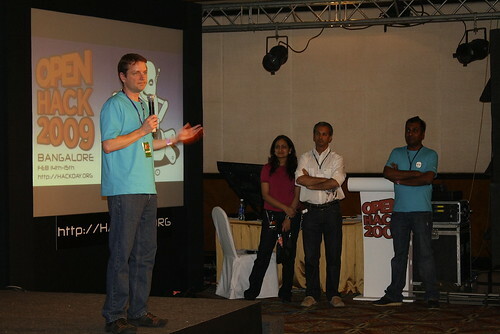 Served as Judge at IEEEXTREME, an International programming contest. This one again came in as a surprise to me, two of my very good friends, Srikanta and Suhas, who are IEEE members; recommended me as a judge in IEEE Xtreme 5.0, totally out of blue and I deem myself to be lucky enough to have such a great opportunity, it was a experience to be remembered :)! Gaining the admit into IIT Kanpur. A lot has already been said about how lucky I was in exam and interviews in my previous posts, here, here and here. But it is important enough milestone in my life, worth to be noted again :)! Graduating as the best outgoing student from my undergraduate department, MSRIT. This is probably the most enjoying and sweet experience till now, the credit for this goes mainly to my peers and friends from my undergrad college. Also, I was lucky enough to have got some of the best teachers who let me do what interests me and it was the major factor that led me to explore the interesting topics on my own! Once in a lifetime opportunity to meet turing award winners @ ACM India Launch event. With Barbara Liskov, ACM Turing award 2008. With Tony Hoare, ACM Turing award 1980. Brief encounter with David Filo @ Open Hack day – 2009. I was fortunate enough to meet Yahoo! Co-founder Mr. David Filo too! I witnessed his inspiring speech at Yahoo’s Open Hack Day – 2008! … and lot others – there are just too many to pen down! There has been one common ‘lucky’ thing at every place I went, that is my friends and guides(Teachers and seniors), I just can’t thank them enough to have made me a person that I am today :)! To conclude this post, I have only one thing to say, even though luck is not the only factor, it plays a crucial role in life!